Who actually enjoys cleaning the bathroom? If you raised your hand just now, you’re welcome to come over and clean our bathrooms any time you want to. Scrubbing the bathroom floor, shower walls and all around those faucets and hard to reach places can be a drag. Need we mention reaching behind the toilet? Gross. Aside from the obvious discomfort of being around germs, there is also the factor of breathing in harsh chemicals such as bleach. 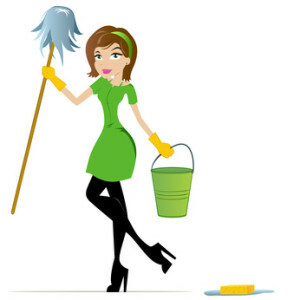 Not everyone can afford a maid to come in and do the dirty work…if only there were a way to make this germy job simpler and quicker for those of us who would rather do something different with our time. Hopefully everyone has had the chance to get in and clean grout with a toothbrush at one point in their lives – we say hopefully, because that means you know how much of a pain it is and will refrain from having grout all over your future bathroom. The more grout, the tougher the cleaning job, so one obvious way to eliminate some of the hassle is to create a space with fewer grout lines. You can do this by installing larger tiles or natural stone on walls and floors, or eliminating seams altogether with options such as concrete or seamless vinyl floors. Choosing seamless countertop and wall options will also help in the cleaning department; and if you don’t like cleaning glass shower doors, why not create a shower space with a curtain, or no door if your space allows? If you’re sick of reaching behind the toilet and around odd shaped crevices, or tired of cleaning around the faucets, one solution would be to wall-mount what you can. There are options available for wall-mounted toilets (making for an easy mop-job underneath), fixtures and vanities. Even if you don’t choose to take everything off of the floor, one or two of these options would surely cut down your cleaning time noticeably. Most bathrooms have a fan to help with air circulation. This is an extremely important feature to help eliminate excess moisture in the bathroom air, which can lead to mold and mildew. When choosing a bathroom fan, make sure you find one that is quiet, but efficient. Also be certain that your fans are ducted properly to ensure effectiveness. There are many things that can be done to simplify your bathroom cleaning process. Comment below with any options you’ve found that worked for your bathroom.